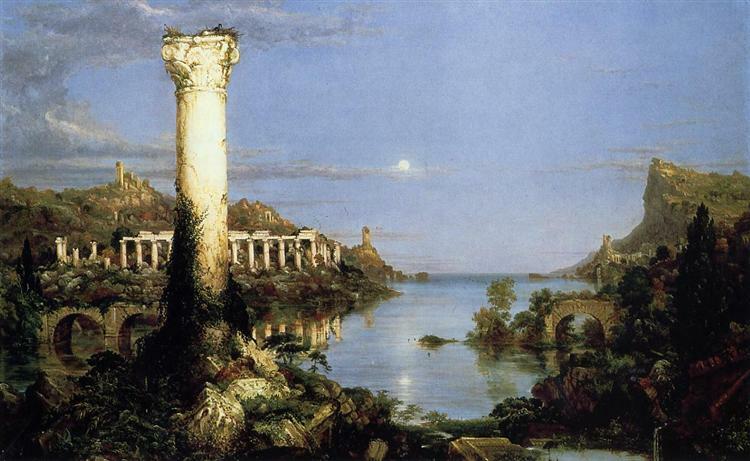 The Titan's Goblet is an oil painting by the English-born American landscape artist Thomas Cole. 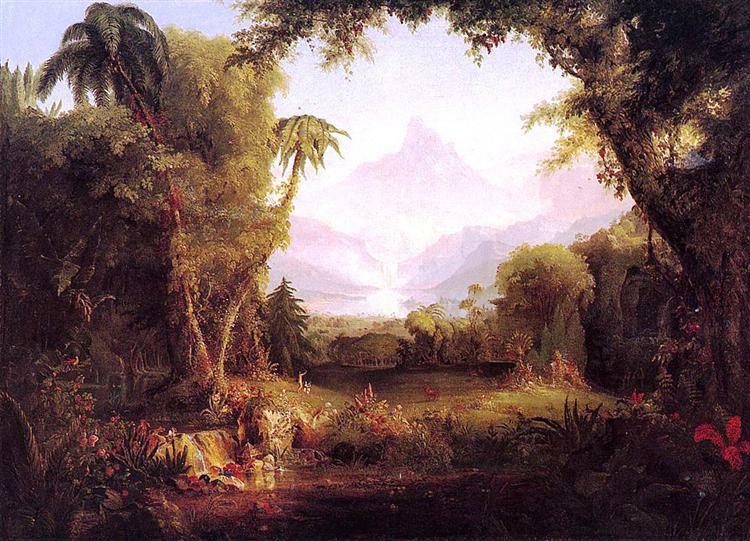 Painted in 1833, it is perhaps the most enigmatic of Cole's allegorical or imaginary landscape scenes. It is a work that "defies full explanation", according to the Metropolitan Museum of Art. 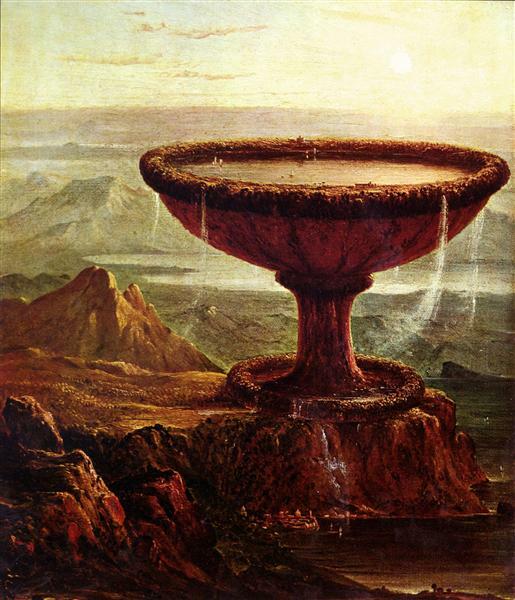 The Titan's Goblet has been called a "picture within a picture" and a "landscape within a landscape": the goblet stands on conventional terrain, but its inhabitants live along its rim in a world all their own. 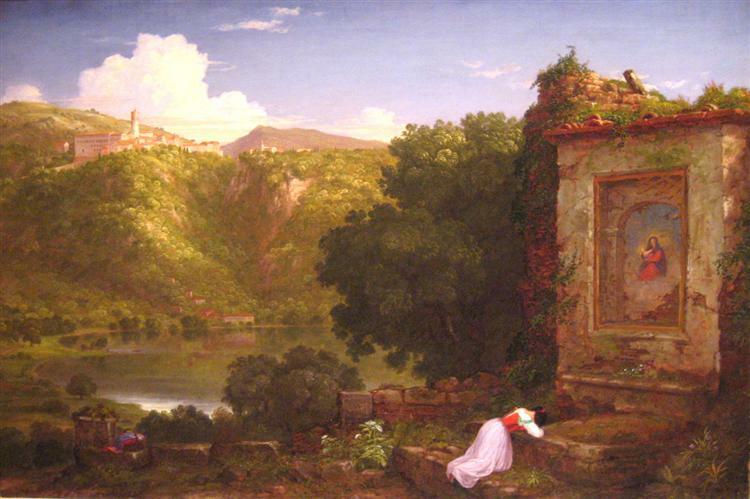 Vegetation covers the entire brim, broken only by two tiny buildings, a Greek temple and an Italian palace. The vast waters are dotted with sailing vessels. Where the water spills upon the ground below, grass and a more rudimentary civilization spring up. Cole often provided text to accompany his paintings, but did not comment on The Titan's Goblet, leaving his intentions open to debate. In the 1880s, one interpretation related Coles goblet to the world tree and specifically to the Yggdrasil in Norse mythology. A 1904 auction catalog continued this theme, writing "the spiritual idea in the centre of the painting, conveying the beautiful Norse theory that life and the world is but a tree with ramifying branches, is carefully carried out by the painter". It is not obvious, however, that Cole would have been familiar with this concept, and critic Elwood C. Parry suggests that the likeness to any mythological tree is limited to the similarity of the goblet's stem to a tree trunk. There is nothing about the goblet analogous to branches or roots. The scale of the massive stone goblet contrasts with that of the traditional landscape scene around it, inviting comparisons with the large stone objects left by ancient races of giants in Greek mythology—a view endorsed by art historian Erwin Panofsky in the 1960s. 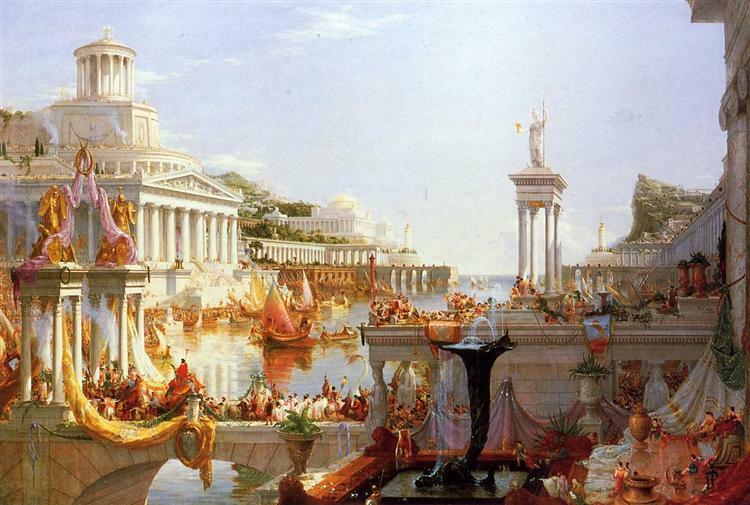 The painting's title (given by Cole on the back of the canvas) seems to support this idea, as if much time had passed between the creation of this goblet and the current scene. 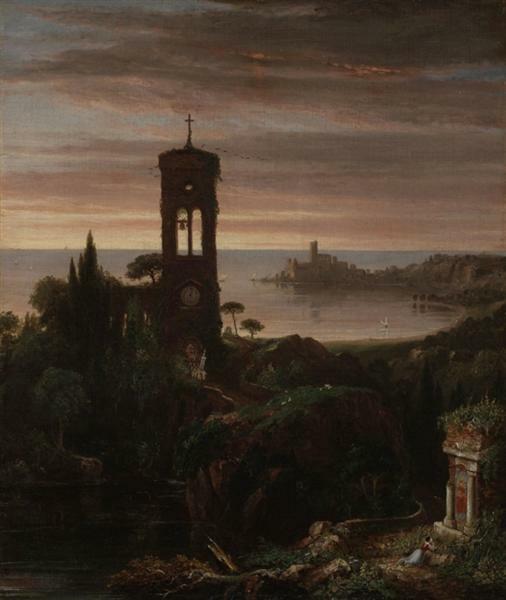 The setting sun, a romantic symbol, also evokes the passage of time. The dominance of the goblet in the painting might suggest a cosmological interpretation. Parry considers but rejects a comparison with the exterior panels of Hieronymus Bosch's Garden of Earthly Delights (c. 1500), which are generally taken to depict the creation of Earth. Both images are of a contained world, but use water and terrain in differing proportions. Cole's Goblet offers neither iconography nor an inscription that would confirm a religious interpretation of the picture. Furthermore, the painter has placed the goblet far from the center of the canvas, which minimizes its emblematic significance. The waters of the goblet, though, can be seen as a civilizing influence. The inhabitants of the goblet have a Utopian existence, pleasure boating on the tranquil waters and living among the temples and leafy woods. Where the waters spill onto the landscape below—where the two worlds interact—signs of life appear. In the background, far from the influence of the goblet's waters, the mountains are desolate and rocky. 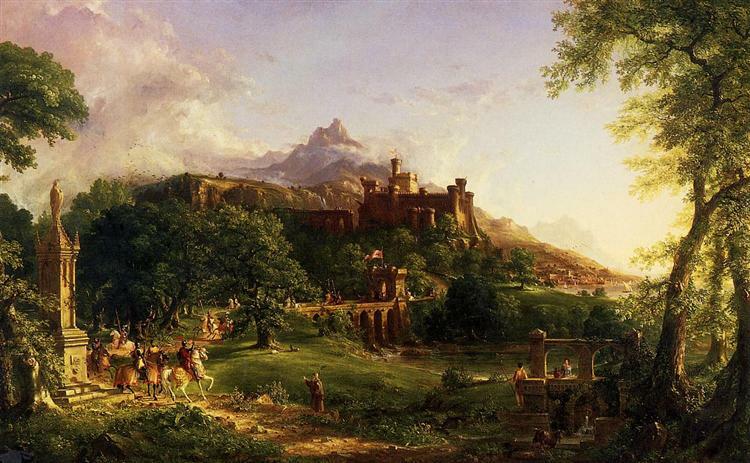 A similar depiction of civilization by the waterside can be seen in Cole's An Evening in Arcady (1843). The Vesper Hymn •et; XIX cent.